This paper describes algorithms for the animation of men and women performing three dynamic athletic behaviors: running, bicycling, and vaulting. We animate these behaviors using control algorithms that cause a physically realistic model to perform the desired maneuver. For example, control algorithms allow the simulated humans to maintain balance while moving their arms, to run or bicycle at a variety of speeds, and to perform a handspring vault. Algorithms for group behaviors allow a number of simulated bicyclists to ride as a group while avoiding simple patterns of obstacles. We add secondary motion to the animations with springmass simulations of clothing driven by the rigid-body motion of the simulated human. For each simulation, we compare the computed motion to that of humans performing similar maneuvers both qualitatively through the comparison of real and simulated video images and quantitatively through the comparison of simulated and biomechanical data. Jessica K. Hodgins, Wayne L. Wooten, David C. Brogan, James F. O'Brien (1995). 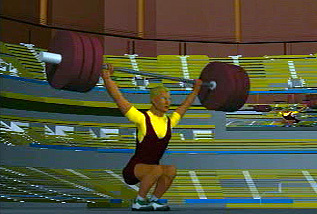 Animating Human Athletics. Proceedings of SIGGRAPH, 71--78.